Last week I went to a work meeting in Gloucester, giving me hours of time to fill on the train. There’s only so much work discussions and email you can do on the train, so I popped into WH Smith and picked up a couple of baking magazines. 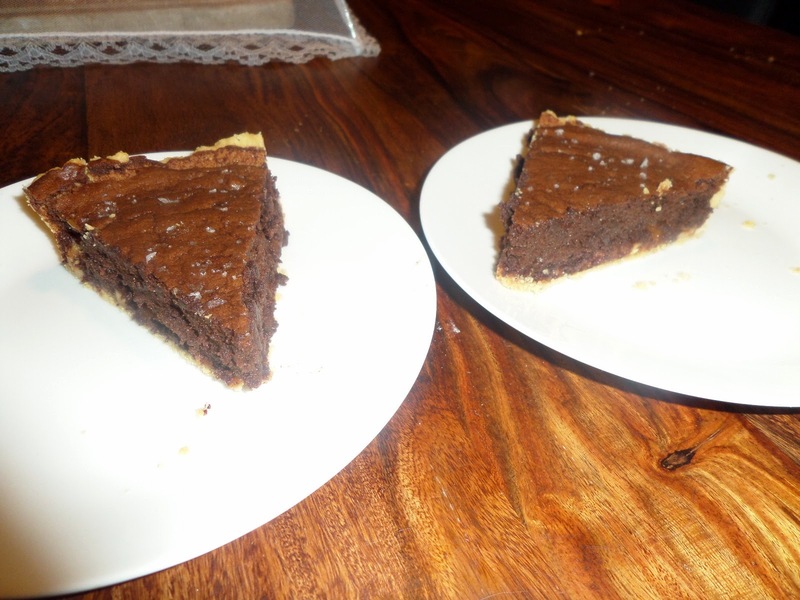 One was all about chocolate baking… and didn’t have a single inspiring recipe. First to go straight to my hips will be this chocolate, hazelnut & salted caramel tart, on page 81 of the magazine. 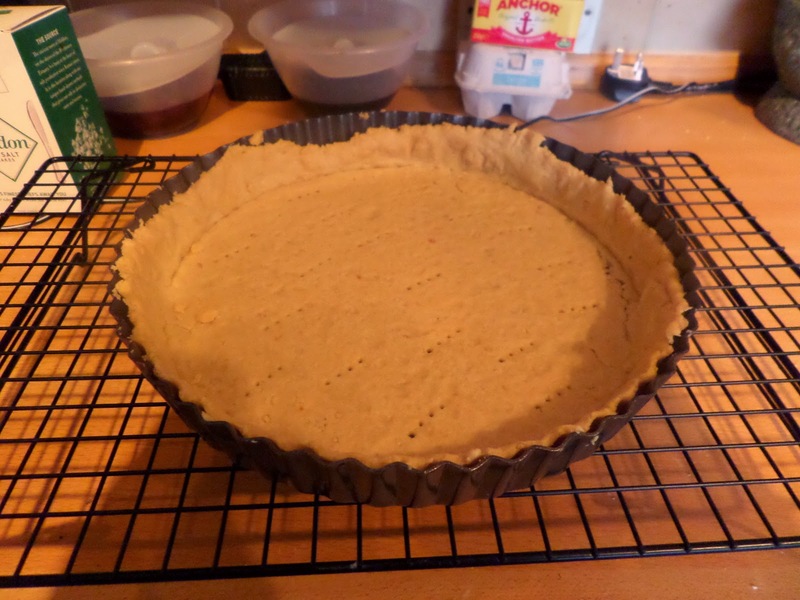 Use the food processor to turn the hazelnuts into ground hazelnuts, then add the flour, sugar & butter and process into breadcrumb-like texture, then add the egg yolk & water to form a dough. Form into a disc, wrap in cling-film, and chill for 30 minutes. 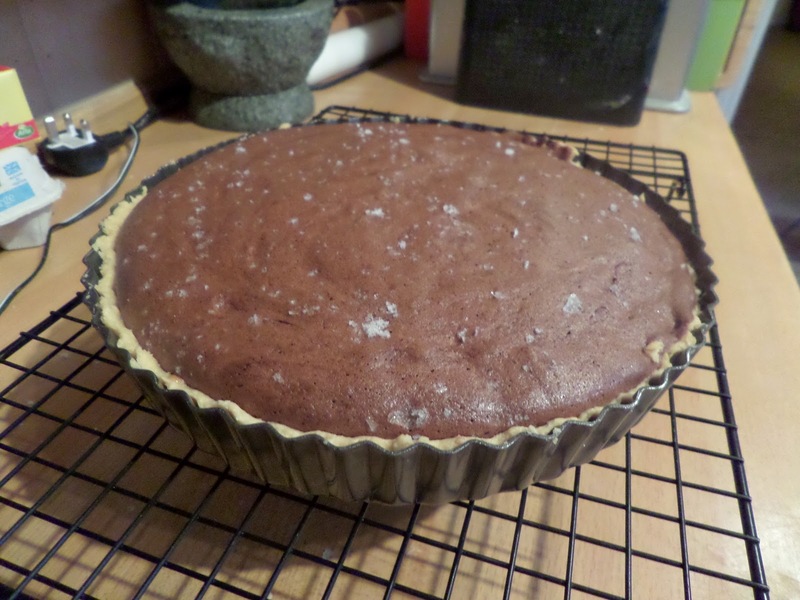 Roll out and fit into a 23cm loose-base tart tin, prick holes in the bottom, and chill to avoid shrinkage. Line with foil and baking beans and blind bake at 160C fan for 20 minutes, then remove the foil and give it another 5-10 minutes until it starts to colour, then allow to cool. 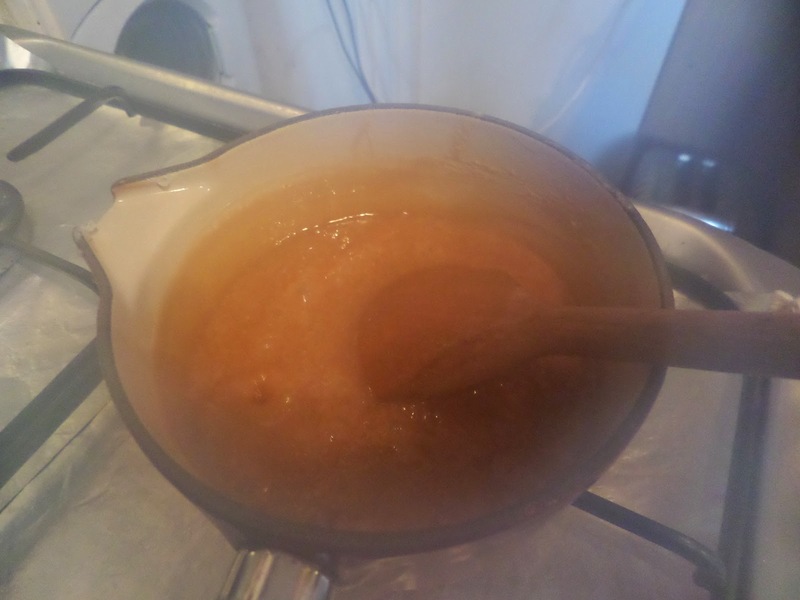 Dissolve sugar into water in a pan on low heat, then turn up the heat until it turns amber (without stirring). Reduce the heat and add the butter, syrup & cream, stirring until it’s smooth and thick. 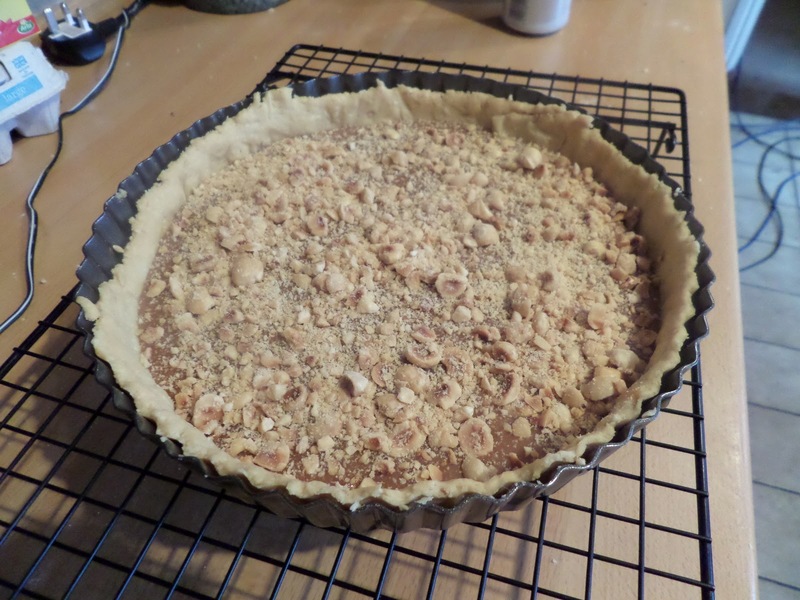 Remove form the heat and add the salt, then allow to cool slightly, then spread on the pastry and scatter the toasted hazelnuts on top. Melt the chocolate & butter in a bain marie, stirring until smooth, then take off the heat. In a separate bowl whisk the eggs, egg yolk & sugar until thick and pale (5+ minutes). 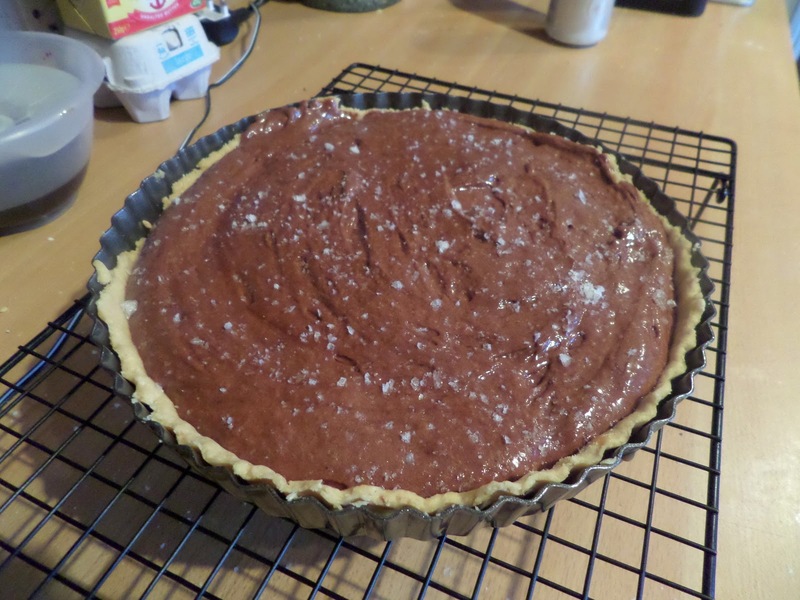 Fold in the melted chocolate & cocoa, then pour into the tart and sprinkle with sea salt flakes. Cook for 20-25 minutes (I assume at the same temperature as before… tut tut whoever wrote this recipe!) 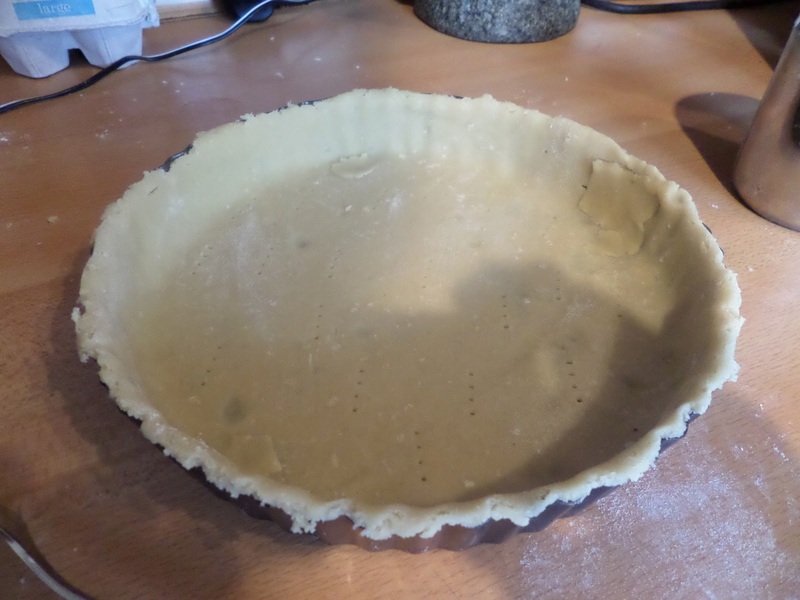 until set and a crust has formed on the top. Allow to cool to room temperature before serving… that’s not going to be easy! It was delicious… but then of course it was: chocolate… caramel… hazelnuts… salt: what do you expect!? Too tempting. Don’t know whether I would have the will-power to resist it for long. I didn’t have the will power, my slices are all gone. Soph is torturing by saving her last piece in the fridge!